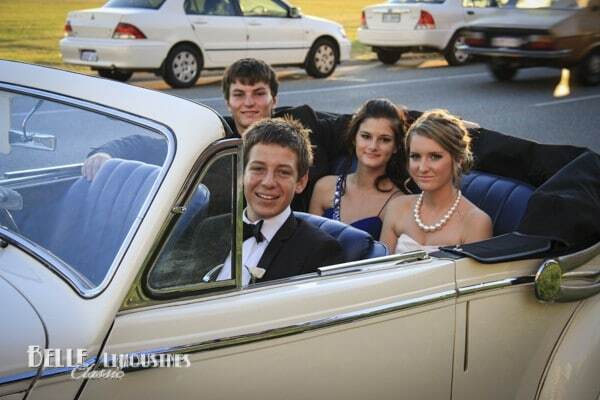 Belle Classic Limousines is looking forward to driving you and your friends to your school ball in style. We cater for couples in luxury sedans and classic cars through to large friendship groups with multiple Chrysler or Rolls Royce limousines. Based on a full passenger capacity return rates can be from $80 per head (dependent upon the locations involved and total hire time). School ball limos are stocked with iced water and complimentary soft-drinks. 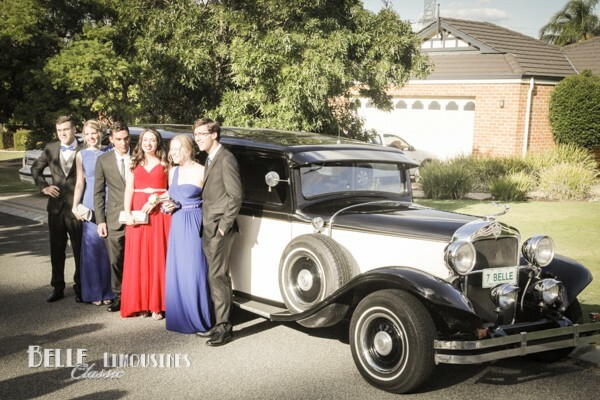 Belle Classic chauffeurs will assist with photos if required. The Belle Classic jet door Chrysler is fitted with the latest in lighting effects and has the same superior sound system with full iPhone control from the rear for your music on the night. Your music can also be played from DVD, USB or any iPod. The jet door access to the Chrysler limo saves the seat shuffle and makes for a great entrance statement for your school ball. 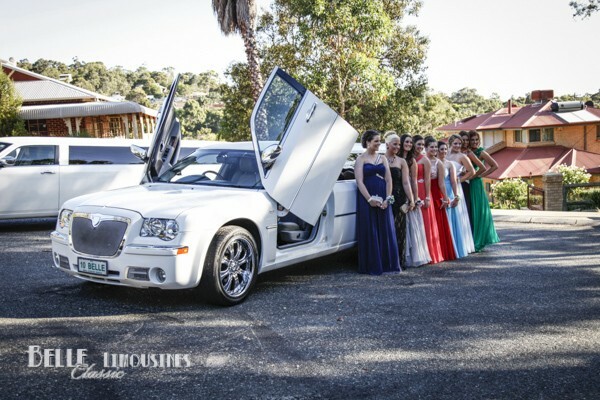 The Belle Chrysler limo with scissor doors is a top of the range Asanti edition Chrysler with a thumping sound system with full iPhone control in the rear for your music and a fantasy fairy light interior for great effect on school ball night. The ‘lambo doors’ are ever popular for photographs at Kings Park or the South Perth foreshore. Bring your favourite playlist on an iPod or iPhone, USB thumb drive or burn a DVD with your popular video tracks and enjoy the LCD screens bringing the music to life. The luxury Rolls Royce limos do not have the flashing lights but make an entry statement all of their own. Great for smaller groups of students seeking something completely different at an affordable price. The Rolls Royce Spirit limos are fitted with up to date sound systems to play music direct from your iPhone on the night. The Rolls Royce Spirit limos are one of the few to be able to drop-off and pick-up at the top of the Hyatt Regency ramp. Make an entrance your friends will envy as they trudge up the stairs. 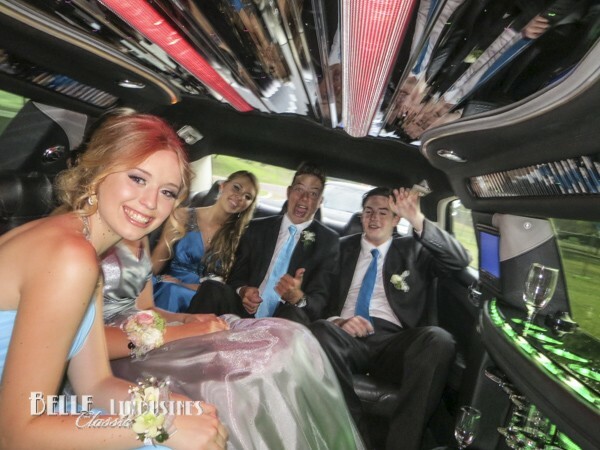 Perth’s best kept secret – our newly upgraded REO limo is a fun ride on your school ball night. Perfect for three couples this six seat limousine is unique. It is the only remaining REO SpeedWagon limousine in the world. Belle offer a range of classic Jaguar and Rolls Royce sedans for couples wanting a quieter ride to the ball. From pick-up at home, photographs with your family and friends on departure and at Kings Park, the South Perth foreshore or your choice of venue on the way through to a safe return journey home. Travel to an after party can be arranged in most cases. 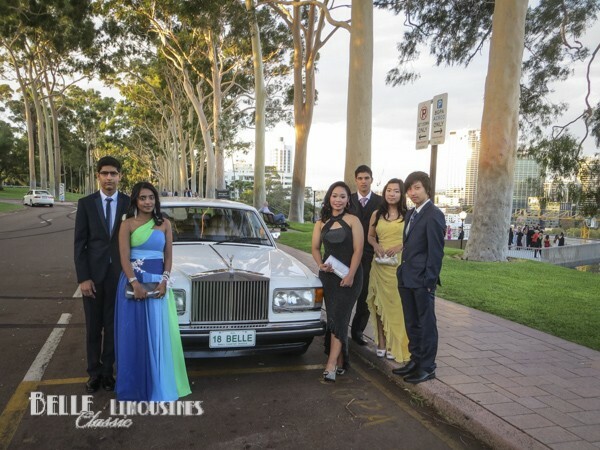 Pick-up is usually 1 – 1.5 hours prior to the school ball depending upon the locations involved. It is common for students to over estimate the time required for photos at Kings Park and make the pick-up time too early. As a ‘rule of thumb’ calculate the time to drive from the pick-up location to the school ball venue and add 20 – 25 minutes for the photo stop plus any time needed if the photos are not on a direct route to the venue. 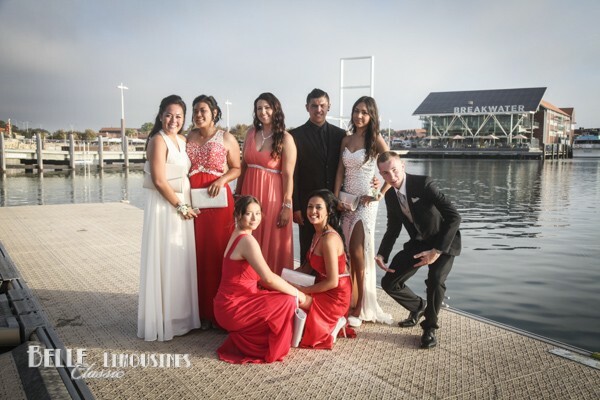 Pick somewhere on the way to your ball and preferably close to the school ball venue. That way you can maximise your time on photos with a known short drive to the ball location. 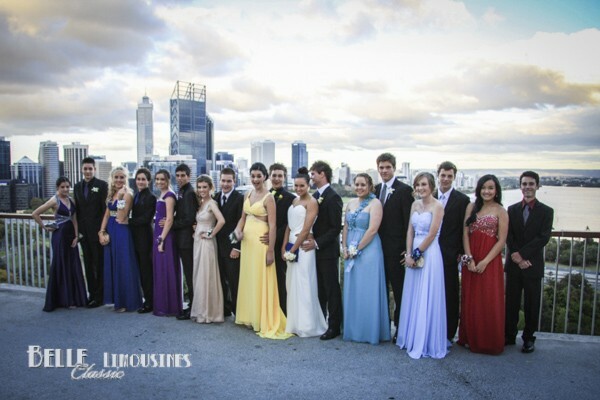 Be aware that some venues like Kings Park can have 40 – 50 limos passing through on a busy school ball night and it may be congested and possibly you may not be able to stop on Fraser Road. 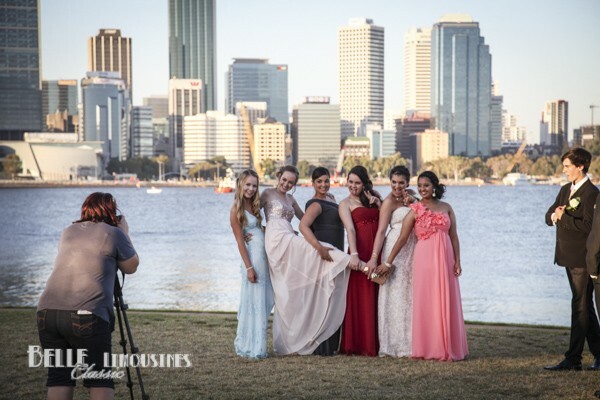 If traveling from south of the river into the city, consider having your photo stop on the South Perth foreshore. 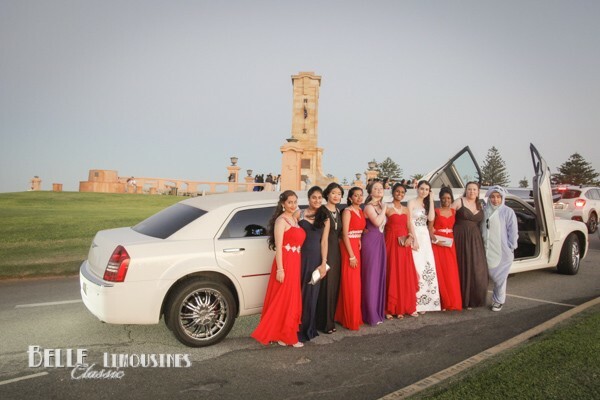 Belle Limousines drivers will discuss the pick-up point with the contact student(s) at drop-off at the ball and give the students a card with the contact number to facilitate meeting at the end of the night if the limo cannot park where expected. The standard return is to the single pick-up address before the ball. If students wish to travel to an after party it needs to be negotiated and agreed before the night. As a duty of care to the parents who book the car a driver will not drive to an after party if it is not scheduled prior to the evening. Additional charges may apply if the after party is not in the immediate proximity to the original pick-up point. If students need to get changed prior to driving to the after party this should be limited to a ten minute change over before the limo leaves. 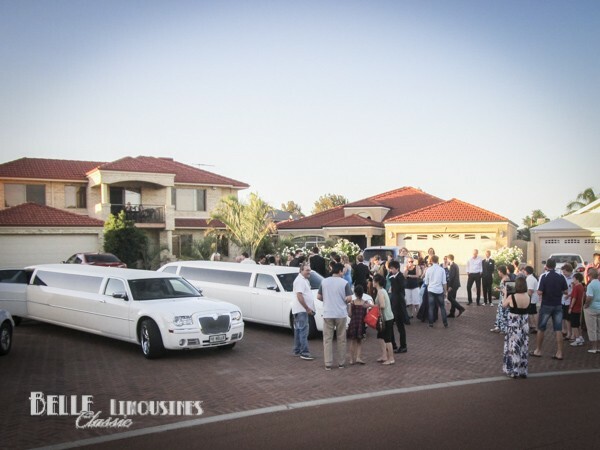 Choose from a classic car for one or two couples through to getting Belle Classic to organise limousines for a crowd. To inquire or book your school ball limousines simply complete the form below or telephone 9279 9922 to confirm vehicle availability and discuss your requirements if you prefer. What day would you like the car? What time would you like the pick up? How long would you like the limo for? What type of vehicle do you prefer? How many vehicles do you do require? How did you hear about Belle Classic Limousines?